These features are realizable through a simple API, which allows a straight-forward integration into existing systems. The Reflexxes Motion Libraries enable new opportunities and provide advanced features for robotics and servo drive control applications that have not been possible before. Each library, Type II and Type IV, has a C++ API and contains a set of Online Trajectory Generation (OTG) algorithms that are designed to control robots and mechanical systems in order to take advantage of the features above. The Type IV library is more advanced than the Type II library, because it allows for jerk-limitation and considers current acceleration values (see also overview page). A description is also provided on the documentation pages of the Type II and the Type IV libraries. The following papers provide further technical insights of these new algorithms and their application. 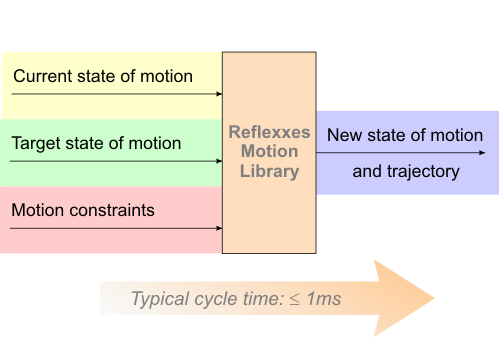 Opening the Door to New Sensor-Based Robot Applications - The Reflexxes Motion Libraries. In Proc. of the IEEE International Conference on Robotics and Automation, Shanghai, China, May 2011. On-Line Trajectory Generation in Robotic Systems. First edition, Springer Tracts in Advanced Robotics, Vol. 58, Springerverlag, Berlin/Heidelberg, Germany, January 2010. On-Line Trajectory Generation: Straight-Line Trajectories. IEEE Trans. on Robotics. Vol. 27, No. 5, pp. 1010-1016, October 2011. T. Kroeger and F. M. Wahl. On-Line Trajectory Generation: Basic Concepts for Instantaneous Reactions to Unforeseen Events. IEEE Trans. on Robotics. Vol. 26, No. 1, pp. 94-111, February 2010. On-Line Trajectory Generation: Nonconstant Motion Constraints. In Proc. of the IEEE International Conference on Robotics and Automation, Saint Paul, MN, USA, May 2012. T. Kroeger and J. Padial. Simple and Robust Visual Servo Control of Robot Arms Using an On-Line Trajectory Generator. T. Kroeger and B. Finkemeyer. Robot Motion Control During Abrupt Switchings Between Manipulation Primitives. In Workshop on Mobile Manipulation at the IEEE International Conference on Robotics and Automation, Shanghai, China, May 2011. In Proc. of the IEEE International Conference on Robotics and Automation, pp. 4009-4015, Anchorage, AK, USA, May 2010. Low-Level Control of Robot Manipulators: Sensor-Guided Control and On-Line Trajectory Generation. In Workshop on Innovative Robot Control Architectures for Demanding (Research) Applications - How to Modify and Enhance Commercial Controllers at the IEEE International Conference on Robotics and Automation, pp. 46-53, Anchorage, AK, USA, May 2010. Multi-Sensor Integration and Sensor Fusion in Industrial Manipulation: Hybrid Switched Control, Trajectory Generation, and Software Development. In Proc. of the IEEE International Conference on Multisensor Fusion and Integration for Intelligent Systems, pp. 411-418, Seoul, South Korea, August 2008. T. Kroeger, A. Tomiczek, and F. M. Wahl. In Proc. of the IEEE/RSJ International Conference on Intelligent Robots and Systems, pp. 736-741, Beijing, China, October 2006. Copyright © 2016 Reflexxes GmbH. All Rights Reserved.